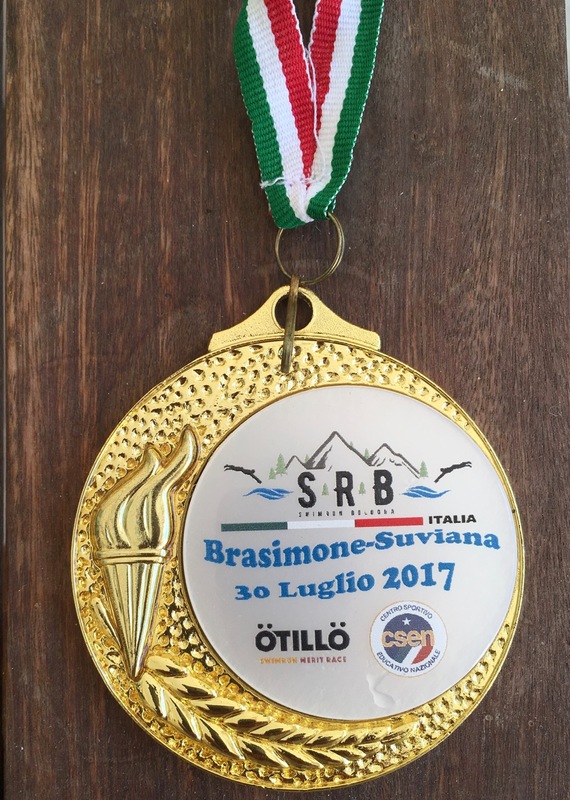 We returned home from the SwimRun Bologna 2017 event, which took place in Italy about mid-way between Bologna and Florence, swearing we must do it AGAIN. This was only our 3rd swimrun race, and it was easily the most enjoyable so far! There were several things about this race that made it a little different for us, so READ ON and find out why we'll be going back this year, 2019! But first of all, where exactly did it take place? 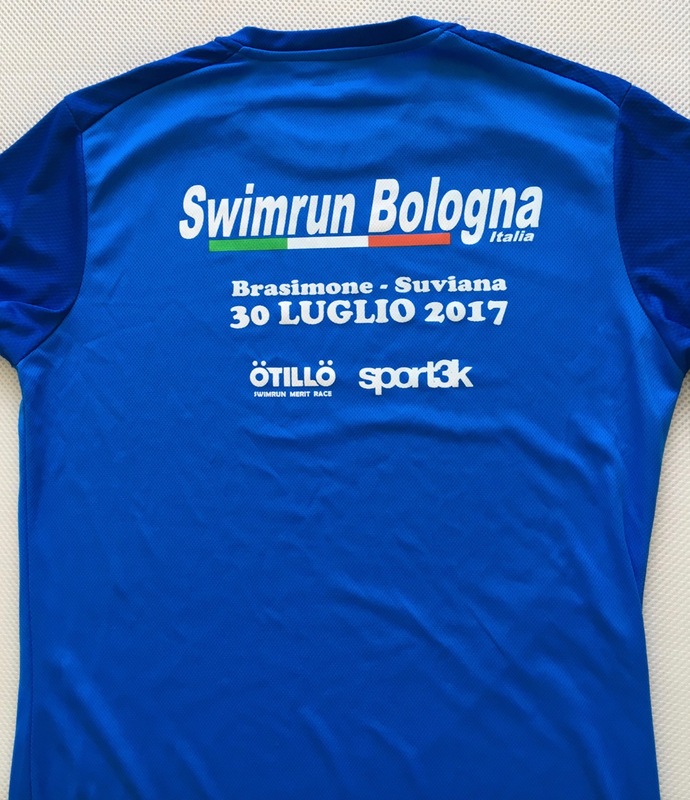 The name of the event is SwimRun Bologna, but ACTUALLY it's a little closer to Florence than it is to Bologna. This tells you up front that it's held in a beautiful area of northern Italy, with stunning countryside and lakes. The start area of the race is close to an information center on Lago di Brasimone, a man-made lake behind a dam which is used to generate hydro-electric power. It may sound a little industrial, and indeed a grey power plant can be seen through the trees on one side of the lake, but otherwise the water is blue-green and very clear. The information center is used for race registration, collecting your race swimcap and T shirt. AND there are large, clean and private toilets! The course takes in another lake about 4 miles downhill, Lago di Suviana, which is also man-made for electricity generation. These two lakes are popular with holidaymakers, for swimming, boating and fishing, and they are surrounded by woods and forest. 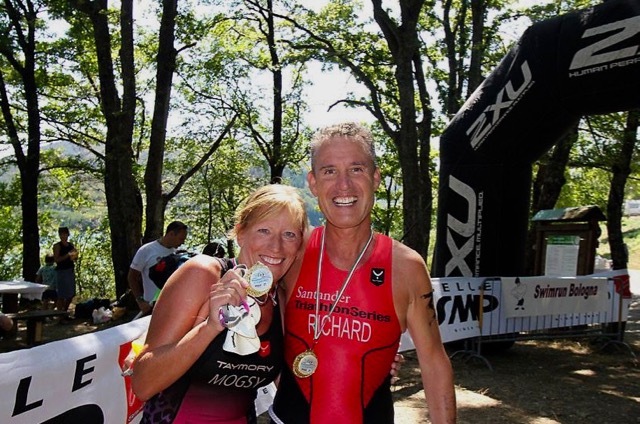 There's also a restaurant and bar area near the water and energy drink station at the lake edge, also with private toilets; as this is about halfway through the race, it's ideally situated, and Richard took advantage of the toilet availability before topping up his energy levels! SO WHAT MADE THIS RACE DIFFERENT? There are several things, for us as "newbie" SwimRunners! First, it's so warm that you don't need a wetsuit. Just about everyone wears a triathlon suit. We really liked this aspect of the race, because as "newbies" to SwimRun we are still coming to terms with running in a wetsuit, and swimming in waters cold enough to need a wetsuit in the first place!! Second, the swimming legs were in freshwater lakes, so we could take the odd swallow of water if we were thirsty mid-swim, and also we didn't get that "salty mouth" sensation that is part of any open-water swim race in the sea. On the flip side, the water is a little cloudy, so we didn't see many fish or other sights. Third, the air temperature was over 80 degrees F, so everyone got quite hot on the running sections! Fortunately quite a lot of running was through woods, so there is plenty of shade from direct sunlight. Because we live in Spain, we are used to running in hot conditions, so it suited us quite well! Fourth, there were LOTS of water stations around the route. Unlike the 2 Ötillö events that we have done in Croatia and Switzerland, where there were only 2 water/energy stations on the sprint distance - about 10 miles - although to be fair in Switzerland you could use one of the stations twice. Whatever, the SwimRun Bologna organizers really had the water stops in the best places, and ALSO stocked with different energy options such as GU gels, energy drinks, Coke, and plain water. Perfect! The final difference in this event was the finish area refreshments. In our own personal opinion, the Ötillö sprint events have minimal refreshments at the end of the course. By contrast, SwimRun Bologna had laid on quite a feast, with 3 different types of pasta (this IS Italy, after all! ), bananas, apples, cakes of all types, water, energy drinks, and even cold beer! This is our type of race! Oh, and one final thing - there is a medal for finishing the event, which is a much appreciated recognition of our efforts after over 5 hours of racing. There's also a pretty cool T-shirt, which in our experience of many other race disciplines, is of good quality and actually a good fit too! Trust the Italians to be stylish! The medal - as you can see, it's an Ötillö merit race as well. A nice T-shirt with high-quality printing and a flattering fit ! BUT WHAT WAS THE RACE COURSE LIKE? 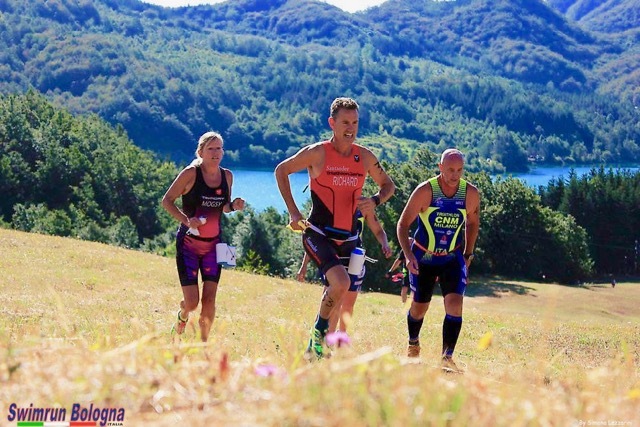 We think that SwimRun Bologna laid out a very nice course, with some challenging hills and some good swim sections. We start near the Lago di Brasimone visitor center, and run about 1.5 miles, initially on road and then steeply uphill on grass. Then it returns to lake level, for the first swim - 700 meters. The swim exit is not so easy to see at first, so I followed the swimmers in front. On the other side of the lake there is another run of just over a mile, initially on road but then going through woods. A really nice run! Running up the steep grassy hill on the first running section. What a view! Back to the lake, and it's 800 meters back over to near the first swim entry and we come to the first water station. Then it's on to the 4 mile running section through the big woods, downhill to the Lago di Suviana. There's a photographer waiting in the woods, to take a snap when you least expect it! Then there's a water stop after 3 miles of running, then the slope gets steeper, down to the lake edge and another energy/water station, with a hidden toilet near the bar/restaurant. Then it's a 1,400 meter swim along the length of the lake, aiming for a picturesque bell tower in the distance. This swim leg felt a bit long, as with no wetsuit and in freshwater I really felt I was lower in the water, compared to swimming in salt water with a wetsuit! After the long swim, there's another mile run, followed by a shorter 500 meters back to the other side, and another chance to tank up at the energy/water station, and use the toilet! Then it's back uphill, through the woods, and this is when it starts to feel hard! After 4 miles uphill through the woods, we get back to the first aid station, for yet more water/Coke. Then we do the circuit of the first lake one more time, before running the very first run leg in reverse direction to get to the finish. The finish line, with our medals! We calculated that we might take 5 hours and 40 minutes, so we were pleased with our final finishing time of 5 hours and 23 minutes! There are cut-off times at 2 hours 30 minutes (which we achieved in 2 hours flat) and at the finish, of 6 hours. We do not speak any italian, but we had every assistance from english-speaking staff, and I have to say we found this event to be really well-organized. We will definitely be back this year, in 2019, to do the SwimRun Bologna event again! Practical notes - we flew into Bologna airport (which is quite small and easily navigated) and hired a car for the 40 minute drive to our accommodation in Castigliano dei Pepoli. This small town is only a 10 minute drive from the SwimRun Bologna start.